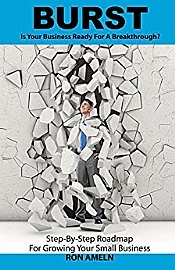 Burst: Is Your Business Ready For A Breakthrough Step-By-Step Roadmap For Growing Your Small Business Is your business stuck? Are you looking for a way to grow your company to the next level? The keys to this growth are simple: the fundamentals of business. The businesses that survive and thrive over time are those that practice the fundamentals. In the book Burst, author Ron Ameln shares the keys to growing a successful small business from his 25 years of interviewing some of the nation's top business owners. The fundamental topics covered in this book include: -Company Vision/Strategy -Your Numbers and Using Them as a Strategic Tool -Sales and Marketing -People (Finding and Keeping “A”-Players) When you are finished with the book, you’ll not only have a better grasp of how to build a great business but you’ll also have created a roadmap that will allow you to focus on the key aspects of your business.